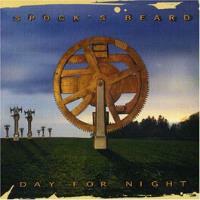 Day for Night is the fourth studio album from Spock`s Beard. The album is a departure from their earlier albums in that shorter numbers has replaced the fifteen-minute suites. Although it may look on the surface that the band is giving up their progressive roots (hey, what are all these short songs doing on the album? ), if given a chance, the album shows itself to be a very nice piece of work. Spock`s Beard is Neal Morse, Alan Morse, Dave Meros, Ryo Okumoto and Nick D`Virgilio. The title track opens the album and is reminiscent of Genesis` "Eleventh Earl of Mar" in terms of song structure (especially the middle interlude). The piece is a strong introduction to the album, and the chorus is typical Neil Morse (In this case that means a very catchy chord progression). Gibberish has a complicated vocal line that Spock`s Beard is noted for. The piece also gives drummer Nick D`Virgilio an opportunity to show of his remarkable talent over the song`s main riff. Spock`s Beard`s previous albums all contained one radio-friendly song, as though the band were letting us know that they weren`t too far out in left field. Day for Night is not exception, and "Skin" is the first song one here. "Skin" is a very radio-accessible song with a great hook. Another radio-ready song, sounding a bit like a hair-band slow anthem, the acoustic guitar is pivotal to this piece. The vocal harmonies are excellent throughout the cut. Spock`s Beard at its finest, this is the longest song on the album at just under ten minutes, and covers a range of styles. The song never ceases to entertain, from the bass-and-drums jazz section towards the start to the handclaps, and it contains a saxophone solo as well. The composition shifts rhythms and styles effortlessly for the duration. The Gypsy is a song that starts softly enough, but also contains some of the hardest rock that is done on the album. The track has a slightly ominous feel during the verses, and a Zeppelin-like two-chord progression appears, the rythrm section giving it either a heavy metal thump or a semi-breakneck treatment. The piece playfully pulls its last punch with Neil Morse alone with an acoustic guitar. This is another highlight of the album. This one is a full-blown ballad, pure and simple. And that`s the best way to describe the song - pure and simple. The lyrics are very direct and heartfelt, and the band throws you no curveballs with the arrangement. It is another radio-friendly song. The Healing Colors of Sound (Part 1) begins a medley that runs through the rest of the album. The piece is an instrumental that runs through a myriad of movements in less than two and a half minutes. From the distant opening notes to its abrupt ending, the composition centers around a six-eight riff that includes Alan Morse`s six-string thunderstorm guitar. Coming right on the heels of The Healing Colors of Sound, My Shoes poses an interesting theological question, if nothing else. The first verses are a bit bluesy, the later verses are somewhat funkier, thanks to the rhythm section of D`Virgilio and bassist Dave Meros. The cut is a bit of a surprise as the last minute is rather subdued - a piano solo over a two-chord progression. A pause to reflect on the point of the song, perhaps? This is a nebulous-but-strange mother-son relationship done with enough syncopation in the beginning (a la "In the Mouth of Madness" from the previous Spock`s album) to let you know that this is going to be a rather unusual number. A quiet number, this one reflects the sentiment of the lyrics. The song expresses a "let it be" attitude. The composition has a slight samba feel to it, and is anchored by piano, gentle synths, and an acoustic guitar solo to create quite an effective song. The Healing Colors of Sound is another positive number, its message being that we can still find solace when things don`t go as planned. The composition is a moderate rocker, but it features some elaborate vocal arrangements as well as a French horn solo. Although a reprise of My Shoes, the chorus also borrows from The Healing Colors of Sound. This song is slower than My Shoes and closes with a fine solo from Alan Morse. The album ends with about 40 seconds from beginning of The Healing Colors of Sound (Part 1), which kind of enforces an "Abbey Road" feel to the medley part of this album. This one is actually titled ("Urban Noise"), but the title does not appear on the CD or cover.